Catching Up: Catoctin and Sugarloaf. 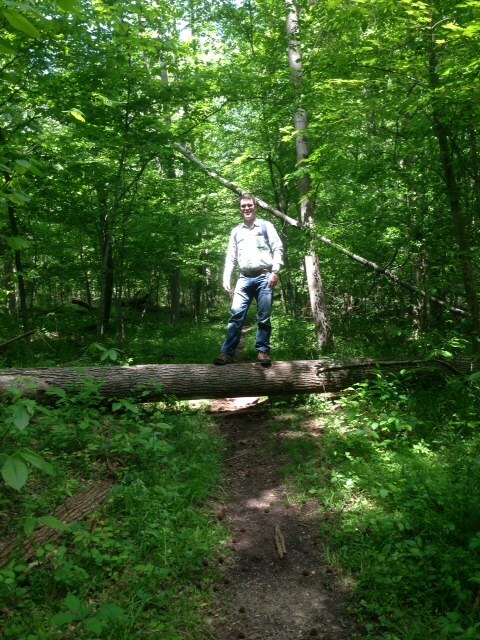 On Sundays May 4 and 11, Karen and I hiked two trails in the Frederick area of Maryland. The first was a five-mile trail in Catoctin Mountain Park. From the Visitor Center, we walked to Cunningham Falls, then headed northeast toward Hog Rock and onward toward the Blue Ridge Summit Overlook. From there we hiked east to where the trail intersects with the path toward Thurmont Vista. Not taking that path, we continued southward back to the Visitor Center. Tod on one of our early hiking adventures. On the 11th, Karen and I hiked six miles (our pedometers read well over six miles, though our trail map says five miles) on Sugarloaf Mountain. As at Catoctin, we arrived at about 10 a.m. and the parking lot was filling quickly. Here we hiked the Blue Trail, which was—for the most part, at least—well marked. We lost the trail for 5-10 minutes at the White Rocks Overlook; we recovered it by walking back along the path by which we arrived at the Rocks until we found where the path diverged, with one part extending to the Overlook, the other part leading off to the right. Whereas the trail at Catoctin was rocky and rooty, Sugarloaf was far more rocky. Throughout our hike at Sugarloaf, the trail was shaded. In the first quarter, we descended along a creekbed—very green and cool. Along the final mile, the trail became sodden and muddy, and—although some planks had been placed where the mud was thickest—we had to circumvent the trail to avoid the mud. On the following Sunday, May 18, Karen and I thought we would try out the three-mile Spicebush Trail in Watkins Regional Park—not far off of Central Ave., in Prince George County. We didn’t get very far before we found that the trail was submerged due to flooding over the past week. Since the trail was a circuit, we thought we’d reverse our direction and see how far we could get, but we hardly got beyond our starting point when we found the trail taped off and marked “Under Construction.” To salvage our trip as best we could, we walked the 1.7 mile Park Loop—which, I might observe, would make an excellent jogging path, as it is paved and generally smooth and level. I wish I could say more for Watkins Regional Park, but the hiking trails at Catoctin and Sugarloaf are definitely worth visiting again. This entry was posted in Birch's Jots on Jaunts by Birch. Bookmark the permalink.